For those of you who haven’t been following the chatter in the Lisette discussion forums, the new Lisette fabrics have begun arriving on shelves at Jo-Ann stores across the United States. We’ve been excited to hear your reaction to seeing them in your local stores, and we hope to hear from more of you as they make their way into the remaining Jo-Ann stores across the country. Now, for those of you who prefer to do your shopping on-line, we’ve got some good news. For a limited time at the Jo-Ann website, you’ll save 40% on all the new Lisette fabrics. Choose from our chambrays, lawns, twills, poplins, sateens, and more. And at 40% off, there’s no reason not to start restocking your stash. Right? Unfortunately, at this time Jo-Ann only ships to United States addresses. Sorry to those of you who live outside the country. I had no idea! When I was at my JoAnns last Friday (in PA) I saw some of these bolts ready to be put out. I fell in love with the Medallions. I’ll be going back tomorrow to check them all out! Hmm, I’m surprised that your chambray is not 100% cotton (20% poly according to JoAnn website). I was not aware of Lisette fabric until I saw some today at JoAnn’s. Got a great deal with my coupons, and the fabric is truly beautiful! I hope to buy more soon. I got my patterns today!!! Yipppeeee. It’s time to cut them out. I was hoping to see some finished photos on flickr. Can we start a Lisette group? I think there are about to be a LOT of Lisette clothes popping up! Jennie, the only way we could get the chambray to look and feel the way we wanted was to use a small bit of poly. It will hold up better this way, too, so I think it’s ok in the end. And it still feels like cotton. Yay!! Thanks, Liesl. I found it. Now I’d better get busy so I can add to it! 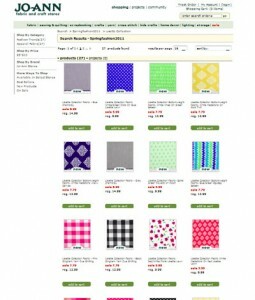 How do you get the sale price on the Lisette fabrics online? When I add them to my cart, it shows the regular price, not the sale price I can see on the main page. Is there a promo code we need to add? Liana, I’m not sure about that. You should contact Jo-Ann with that question. I’m sure they’ll be able to help you out. Thanks. I wrote to them yesterday, but I’ll try contacting them again—or just be more patient! Liana, I had the same problem. I went through the entire checkout process (minus the actual purchase) and the full price was still listed as my cost. I’ve only been able to contact them via email off hours so I’ll try again tomorrow during the day to let you know if I find out anything. I just heard back from Jo-Ann customer service saying to call in the order by phone. Thanks for letting me know, Liana. This morning none of the Lisette fabrics are showing up online at all. Either they realized the problem and are trying to fix it or they’ve had so many orders that their website is overloaded. I hope that it’s fixed soon. I’m going to check our other JoAnn in town for what I’m looking for and call in my order tonight if they don’t have it. If I found a suitable Lisette fabric pattern do you think it could be used for a 9 month old baby boy john-john romper?